Despite all the precautions that you take your eyes may still hurt from exercises. That proves only the fact that your eye muscles started to work and you still did not learn how to relax them! ( and is also count as Eye Relaxation Techinque). I simplified this procedure to the bare minimum. When I feel that my upper eye lids are puffy and the skin that is under my eyebrows is hanging over my eyes I grab one piece of ice (any size) and stand beside sink filled with hot water (just make sure that the water is bearable temperature). Rub the ice against the other hand to ensure that it won’t stick to your skin and then make a few circles over your closed eyes with that piece of ice. Then right away splash your closed eyes with the hot water (careful though! Do not boil your eyes, you may still need them!). Repeat it 7-8 times and all of the puffiness will be gone. This procedure can also be used for the women when they urgently need to prepare for a party. If you are somewhere at work, just splash your eyes with very cold water a few times. Finish up with the Acupressure procedure. I hope, you have loose tea leaves in your house. I, personally, prefer black tea (without any additives and flavors) for this procedure. Make very strong tea (1 teaspoon on ¼ of a glass hot water), steep it for 3-5 minutes and strain. Put your hot tea either outside or into the fridge for a few minutes. Soak cotton pads in that tea, lie down on the bed (floor, sofa) without a pillow and place those soaked tea pads on your closed upper eyelids. The temperature of the tea is totally individual preference. Experiment with applying warm or cold tea soaked cotton pads on your eyes and find out what is the most comfortable temperature for you. The best timing for this procedure is 15-20 minutes. The quickest and the most accessible way to make your eyes look and feel better at any time and place is again the massage of the acupressure dots. In the morning, when you are about to wash your face get some water into your mouth and splash ice-cold water into your face. Perform this procedure any time when you want your eyes to look instantly better. If you got puffy eyes for some reason (staring at your monitor at work, watching too much TV) use either Contrast eye bathing described above or simply cut 2 slices of cucumber (better be organic) and place them for 15-20 on your closed eyes while you are lying down without a pillow. Cucumber has natural ingredients to moisture the skin. If you want your eyelashes to be long, rich and shiny just apply a drop of burr oil at least twice a week and the results will be seen already in a month! Make sure that there are no any traces of cosmetic products on your eyelashes and your eyelids when you put the oil on. 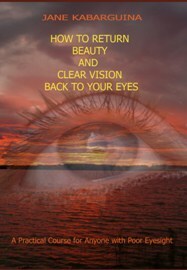 Eye Relaxation technique - Close your eyes as tight as possible squeeze them as much as you can and then suddenly open up unexpectedly wide. Execute this type of blinking until the tears bust out of your eyes. As soon as this happens you may count your goal achieved. You also can use another trick - fill the sink with cold water and try to blink while your face is down in the water. The blood circulation tremendously speeds up inside of little eye blood vessels at this moment, so, please, do not get scared when you look at yourself in the mirror right at the end of this procedure.